NEW YORK A new Gallup survey, touted as the largest of its kind, estimates that 3.4 percent of American adults identify as lesbian, gay, bisexual or transgender. The findings, released Thursday, were based on interviews with more than 121,000 people. 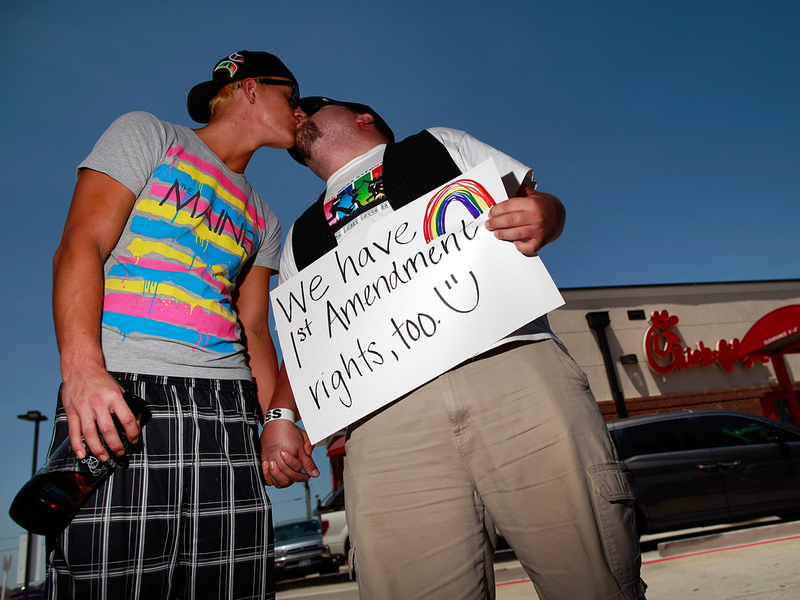 Gallup said it is the largest study ever aimed at calculating the nation's LGBT population. The report's lead author, demographer Gary Gates of the UCLA School of Law's Williams Institute, said he hoped the findings would help puncture some stereotypes about gays and lesbians while illustrating the diversity of their community. "Contemporary media often think of LGBT people as disproportionately white, male, urban and pretty wealthy," he said. "But this data reveal that relative to the general population, the LGBT population has a larger proportion of nonwhite people and clearly is not overly wealthy." According to the survey, which was conducted between June and September, 4.6 percent of African-Americans identify as LGBT, 4 percent of Hispanics, 4.3 percent of Asians and 3.2 percent of whites. Overall, a third of those identifying as LGBT are nonwhite, the report said. There was a slight gender difference  3.6 percent of women identified as LGBT, compared to 3.3 percent of men. And younger adults, aged 18 to 29, were more likely than their elders to identify as LGBT. One striking difference: among 18-to-29-year-olds, 8.3 percent of women identify as LGBT, compared with 4.6 percent of men the same age. In contrast to some previous, smaller studies, the Gallup survey found that identification as LGBT is highest among Americans with the lowest levels of education. Among those with a high school education or less, 3.5 percent identify as LGBT, compared with 2.8 percent of those with a college degree and 3.2 percent of those with postgraduate education. A similar pattern was found regarding income groups. More than 5 percent of those with annual incomes of less than $24,000 identify as LGBT, compared to 2.8 percent of those making more than $60,000 a year. Among those who report income, about 16 percent of LGBT individuals have incomes above $90,000 per year, compared with 21 percent of the overall adult population, the Gallup survey found. It said 35 percent of those who identify as LGBT report incomes of less than $24,000 a year, compared to 24 percent for the population in general. Regarding family status, 20 percent of LGBT individuals said they are married and an additional 18 percent are living with a partner; they weren't asked about the gender of those spouses and partners. Among non-LGBT Americans, 54 percent are married and 4 percent are living with a partner, the report said. The survey found that 32 percent of both LGBT and non-LGBT women have children under 18 in their home. By contrast, 16 percent of LGBT men had children in their home, compared to 31 percent of non-LGBT men. Gates said he was struck by the geographical spread of the LGBT population  pegged at 3.7 percent in the East, 3.6 percent in the West, 3.4 percent in the Midwest and 3.2 percent in the South. The results were based on responses to the question, "Do you, personally, identify as lesbian, gay, bisexual, or transgender?" included in 121,290 Gallup interviews conducted between June 1 and Sept. 30. The overall 3.4 percent figure is similar to a 3.8 percent estimate made previously by Gates after averaging a group of smaller U.S. surveys conducted from 2004 to 2008. The survey noted that its findings did not account for LGBT people who, for whatever reason, did not want to acknowledge their sexual orientation in the interviews.